Is a low income or prolonged unemployment truly cause for financial stress? According to one study, not really. In some states, public assistance programs, or welfare, could pay more than full-time, minimum-wage jobs. Cato Institute’s 2013 Work Versus Welfare Trade-Off study totaled the welfare benefits offered in each state and compared that value with the wages workers would need to earn in order to have an equivalent take-home income. Cato found for long-term dependents, welfare actually pays pretty well. The study examined the package for a single mother with two children, who could use programs such as Temporary Assistance for Needy Families; Supplemental Nutrition Assistance Program (food stamps); Medicaid; housing assistance; utility assistance; and Women, Infants, and Children. But we took the results of this report a bit further to see which states have the biggest gap between the hourly minimum wage equivalent welfare recipients get and the state-mandated amount. When broken down into an hourly wage equivalent, we found the welfare package exceeded minimum-wage jobs in 34 states, as of their 2017 minimum wages. On the other hand, in states, such as Maine, Texas, Florida, and Mississippi, working a minimum-wage job was more profitable than a welfare package. But they’re really just outliers. Imagine if your employer gave you a $6 per hour pay increase for your time and effort on the job. It’s safe to say that raise would be pretty significant. Pennsylvania residents see the same discrepancy between hourly welfare payout equivalents and the statewide minimum wage. In fact, those who receive public assistance are paid $6.53 more than those working full-time, minimum-wage jobs, according to Cato and the National Conference of State Legislatures wage data. Next: One of the Dakotas pays a lot in welfare-assistance programs. North Dakota has seen success as a state with one of the highest gross domestic products per capita and a lowunemployment rate of 2.5%, as of May 2017. Even those on welfare seem to benefit financially from the state’s success, as the hourly welfare payout equivalent is $6.61 per hour higher than the statewide minimum wage of $7.25 per hour. We continue our westward journey to the next state with the biggest welfare and minimum wage pay gap. Nevada’s statewide minimum wage is no higher than the national wage of $7.25 for jobs with health benefits. But welfare recipients are receiving over $7 more in wage equivalencies than those earning minimum wage. Does this substantial assistance benefit deter recipients from ever entering the workforce? Only time will tell. Next: This state has a high minimum wage that’ll just keep rising. California was one of 19 states to raise their minimum wages in 2017. It currently resides at $10.50 and will increase until it reaches $15 in 2022. Much to the chagrin of other low-wage fully employed workers, residents who are on welfare in this Western state see a $7.37 hourly difference between welfare and minimum wage payouts. Maryland is the first of many New England states to appear on this list where welfare pays more than minimum wage. And even though its unemployment numbers are keeping close tabs on the national rate at 4.2%, Cato’s theory that collecting welfare is easier than working could be accurate in this instance. Here, there is a $9.10 discrepancy between money earned by working a minimum-wage job and receiving a welfare package. Next: Even Vermont’s higher minimum wage doesn’t cut it. Vermont offers a minimum wage higher than most of its neighboring states, so why would some choose not to work? Americans on welfare in Vermont can earn over $20 per hour based on the pre-tax wage equivalent of their assistance benefits. That equates to a $10.36 per hour difference — more than double — the earnings for residents working minimum-wage jobs in the state. Next: Wyoming is stingy with the welfare, but it still makes a difference. Wyoming offers one of the lowest welfare benefits packages on this list. However, residents here can still earn more than the proposed $15 national minimum wage many Americans want. Wyoming’s minimum wage is a low $5.15, but welfare payouts still provide over $10.53 more than those who work full-time, minimum-wage jobs. The tiniest state in the country has one of the biggest differences between welfare and minimum wage payouts — a $11.23 per hour difference to be exact. To put the wage gap in perspective, those on welfare could earn more per hour than median hourly wages for auto mechanics and human resources assistants. Next: Connecticut is in a similar situation. In terms of pay gaps, Connecticut and Rhode Island are pretty similar. They both have a $11.23 per hour difference between welfare and minimum-wage payouts. However, Connecticut’s unemployment rate is higher than the national average at 4.9%. It also offers a slightly larger welfare package, making it the state with the seventh largest welfare and minimum wage discrepancy. Next: The pay difference in the Big Apple is substantial. New York’s minimum wage varies across the state, depending on geographic location and employer size. Residents in New York City can earn a minimum wage as high as $13, where others only earn $9.70 per hour. Regardless, welfare recipients in the state could earn $11.31 more than minimum-wage workers. Although its neighbor to the north, Maine, is the only New England state where welfare recipients are actually paid less than minimum wage, New Hampshire residents are another story entirely. In fact, the Cato data shows this state has the fifth largest pay gap between minimum wage and welfare at $11.86 per hour. Washington, D.C., is no stranger to financial “best of” and “worst of” lists. With such a high cost of living, its welfare package for a single mom with two children is one of the top in the country. But when accounting for the difference between the welfare and minimum-wage payouts, those receiving public assistance can earn nearly $12 more than those working full-time, minimum-wage jobs. Next: What’s with New Jersey? New Jersey cracks the top three states with large welfare and minimum wage gaps. The state has dealt with its fair share of financial woes, yet its public assistance pay gap remains untouched. Minimum-wage workers earn $8.44 per hour, but those on welfare could receive $20.89 per hour. This equates to a whopping $12.45 per hour pay difference. We round out our tour of the Northeast with Massachusetts. Its $11 minimum wage is one of the higher wages on this list, but both Cato and the national wage data make it pretty clear welfare pays more than minimum wage here. And while a $13.30 payout difference is quite substantial, it’s nowhere near the discrepancy in our No. 1 state. 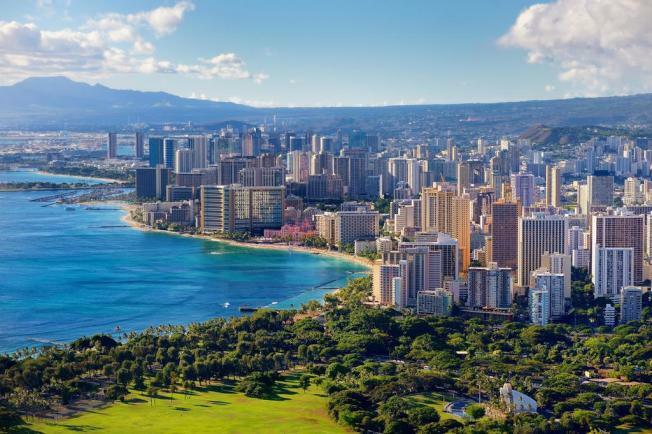 The biggest discrepancy between welfare and minimum-wage payouts is seen in Hawaii with an astonishing gap of $19.88. Not only do residents receive nearly $50,000 in welfare aid, the hourly equivalent is comparable to the national median salary of an electrical engineering technician. But it’s best to note that the high cost of living in this state could distort the data. Regardless, such a high discrepancy between working and welfare is pretty hard to dismiss.